I had created a content type using Site Pages as parent content type. I added site columns to this content type and finally created a new Document Library and added this content type to the library. Now when I click on +New button, it shows me three options i.e. Folder, My Derived Content Type and Link. Now, on selecting My Derived Content Type option to create a new page in this library, it is redirecting me to the SitePages and creates a page in SitePages library instead. Is anyone also facing the same issue? If so, do you know why this happening or any solution in this direction will be great help. And yes, I am using SPO Dev Tenant, with preview feature option enabled. Is it possible to provision modern pages anywhere other than Site Pages library? If no, what could be the possible reason? I can reproduce your issue, it’s the default behavior that it links to the page in SitePages library when we create a new page with site page as content type in the document library. As a workaround, you can create a new content type which its parent content type is “Basic Page”. But the new page with Basic Page content type has no modern UI style. 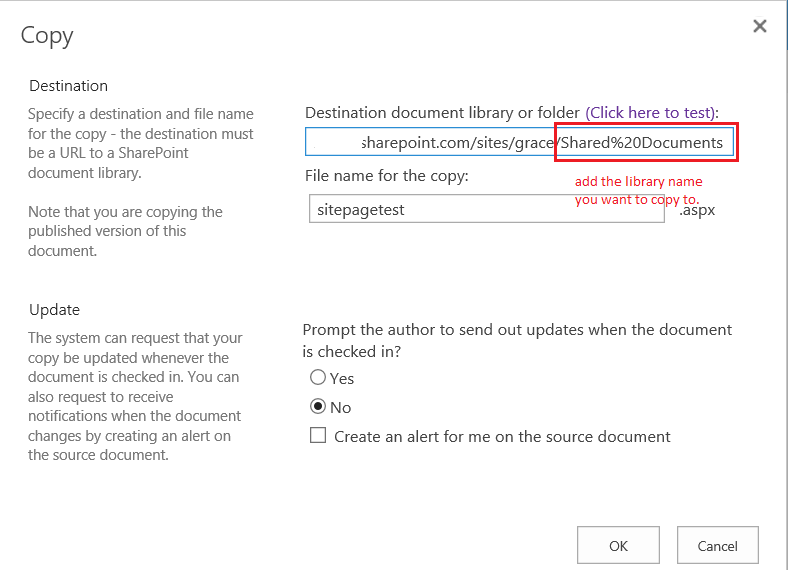 Or you can copy the relevant pages to new document library and delete these pages SitePages library. we can copy the page in Site Pages library through library classic experience. exit modern experience in the library and right click the page, select copy and type the library URL. One does not simply create a new pages library in SharePoint. A Site Pages library is more than just a document library with content types. There are event receivers and other hooks all over the site that enable its functionality. Pages libraries in the non-modern Publishing feature worked the same way. I would advise against trying to hack or work around the limitation. Fighting the platform will cause you more grief than it solves. What you should do instead is create new content types derived from Site Page, and add those to the provided Site Pages library. Not the answer you're looking for? Browse other questions tagged sharepoint-online modern-document-library modern-team-site spo or ask your own question.